백자 달항아리는 보통 높이가 40cm 이상 되는 대형으로, 둥글고 유백색(乳白色)의 형태가 둥근 달을 연상하게 되어 일명 ‘달항아리’라고도 불린다. 조선 17세기 후기~18세기 전기의 약 1세기 동안(특히 18세기 전기 50년간) 조선왕조 유일의 관요(官窯)인 사옹원(司饔院)의 분원(分院) 백자제작소(경기도 광주)에서 만들어진 것으로, 당시 광주 지역에 산포해 있던 340여 개소의 가마 가운데 금사리 가마에서 주로 제작된 것으로 추정하고 있다. 크기가 대형인 탓에 한번에 물레로 올리지 못하고 상하 부분을 따로 만든 후, 두 부분을 접합하여 완성한 것으로 성형(成型)과 번조(燔造)가 매우 어렵다. 순백의 미와 균형감은 전 세계에서 유례를 찾아볼 수 없는 우리나라 백자의 독특하고 대표적인 형식이다. 국보 제310호 백자 달항아리는 높이 43.8cm, 몸통지름 44cm크기로 유약과 태토의 용융상태가 우수하며 입 지름과 바닥 지름의 비가 이상적이어서 전체적으로 안정감을 보인다. 완전한 좌우대칭은 아니지만 약간 비틀어지고 변형된 상태가 전체의 조형에 장애가 되지 않고 오히려 변화를 주면서 생동감을 갖게 한다. White porcelain jars of this type were produced for about a century -- from the latter half of the 17th century to the early half of the 18th century -- at kilns run by Saongwon (Office of the Royal Kitchens), particularly those in Geumsa-ri, Gwangju, Gyeonggi-do Province. These voluminous round jars with pure, rich character are usually over 40cm high with milky white glaze and are often called moon jars. This jar has height of 43.8cm and diameter of 44cm. 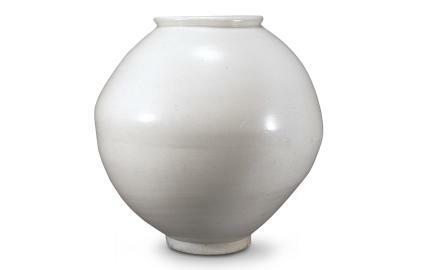 The diameters of the mouth and the base are in ideal proportion, giving the vessel a stable appearance. The jar is slightly asymmetric and warped, adding to the overall vibrancy of the vessel form instead of impairing its beauty. The glaze is smoothly melted into the clay. Given their large size, porcelain jars of this style were formed in two hemispheres that were joined together. It was a precarious job requiring deft hands. Firing also called for high expertise. The unassuming aesthetic of these jars typified the porcelain art of the Joseon Dynasty (1392-1910). Most outstanding examples date back to the early part of the 18th century. During the peak years, there were some 340 kilns in the Gwangju area.